Aging, genetics and environmental toxicity are important etiological factors in Parkinson’s disease (PD). However, its pathogenesis remains unclear. A major obstacle is the lack of an appropriate experimental model which incorporates genetic susceptibility, aging and prolonged environmental toxicity. Here, we explored the interplay amongst these factors using mutant LRRK2R1441G (leucine-rich-repeat-kinase-2) knockin mice. We found that mutant primary cortical and mesencephalic dopaminergic neurons were more susceptible to rotenone-induced ATP deficiency and cell death. Compared with wild-type controls, striatal synaptosomes isolated from young mutant mice exhibited significantly lower dopamine uptake after rotenone toxicity, due to reduced striatal synaptosomal mitochondria and synaptic vesicular proton pump protein (V-ATPase H) levels. Mutant mice developed greater locomotor deficits in open-field tests than wild-type mice following low oral rotenone doses given twice weekly over 50 weeks (half their lifespan). 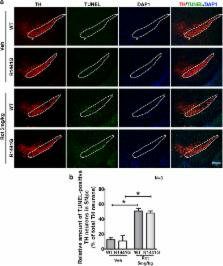 The increased locomotor deficit was associated with specific reduction in striatal mitochondrial Complex-I (NDUFS4) in rotenone-treated mutant but not in similarly treated wild-type mice. Our unique experimental model which incorporates genetic effect, natural aging and prolonged oral environmental toxicity administered to mutant knockin LRRK2 mice over half their life span, with observable and measurable phenotype, is invaluable in further studies of the pathogenic process and therapeutics of PD. Point mutations and deletions of mitochondrial DNA (mtDNA) accumulate in a variety of tissues during ageing in humans, monkeys and rodents. These mutations are unevenly distributed and can accumulate clonally in certain cells, causing a mosaic pattern of respiratory chain deficiency in tissues such as heart, skeletal muscle and brain. In terms of the ageing process, their possible causative effects have been intensely debated because of their low abundance and purely correlative connection with ageing. We have now addressed this question experimentally by creating homozygous knock-in mice that express a proof-reading-deficient version of PolgA, the nucleus-encoded catalytic subunit of mtDNA polymerase. Here we show that the knock-in mice develop an mtDNA mutator phenotype with a threefold to fivefold increase in the levels of point mutations, as well as increased amounts of deleted mtDNA. This increase in somatic mtDNA mutations is associated with reduced lifespan and premature onset of ageing-related phenotypes such as weight loss, reduced subcutaneous fat, alopecia (hair loss), kyphosis (curvature of the spine), osteoporosis, anaemia, reduced fertility and heart enlargement. Our results thus provide a causative link between mtDNA mutations and ageing phenotypes in mammals. Cloning of the gene containing mutations that cause PARK8-linked Parkinson's disease. Parkinson's disease (PD; OMIM #168600) is the second most common neurodegenerative disorder in the Western world and presents as a progressive movement disorder. The hallmark pathological features of PD are loss of dopaminergic neurons from the substantia nigra and neuronal intracellular Lewy body inclusions. Parkinsonism is typically sporadic in nature; however, several rare familial forms are linked to genetic loci, and the identification of causal mutations has provided insight into the disease process. PARK8, identified in 2002 by Funayama and colleagues, appears to be a common cause of familial PD. We describe here the cloning of a novel gene that contains missense mutations segregating with PARK8-linked PD in five families from England and Spain. Because of the tremor observed in PD and because a number of the families are of Basque descent, we have named this protein dardarin, derived from the Basque word dardara, meaning tremor. Combined oral benzo[a]pyrene and inhalatory ozone exposure have no effect on lung tumor development in DNA repair-deficient Xpa mice. Effects of lentinan alone and in combination with fluoropyrimidine anticancer agent on growth of human oral squamous cell carcinoma in vitro and in vivo.